BitTorrent search engine BTJunkie has "voluntarily" shut itself down in order to avoid potential legal action by U.S. authorities. The U.S. government dropped the hammer on file sharing site Megaupload last month, forcing the site offline amidst accusations of various sorts of copyright violations that added up to more than $500 million in lost revenues for someone. Among the charges facing employees of the site are "racketeering conspiracy, conspiracy to commit copyright infringement, conspiring to commit money laundering and two substantive counts of criminal copyright infringement." That's some pretty serious stuff, and although none of the charges have been proven in a court of law, the mere threat of a heavy-handed application of "justice" - Megaupload founder Kim Dotcom is currently languishing in prison awaiting extradition to the United States, having been denied bail by a New Zealand judge - was enough to convince the founder of BTJunkie to get ahead of the curve by getting out of the game. "This is the end of the line my friends. The decision does not come easy, but we've decided to voluntarily shut down," says a farewell message on the site. "We've been fighting for years for your right to communicate, but it's time to move on. It's been an experience of a lifetime, we wish you all the best!" The site has never faced direct legal action but was reported to the U.S. Trade Representative last year and both the RIAA and the MPAA listed it as a "rogue" site responsible for mass copyright violations. Google also censors "btjunkie" as a search term because of its deep connections to piracy. 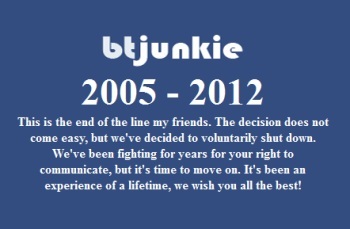 Despite the closure, the founder of BTJunkie told TorrentFreak that he hoped other torrent sites would be able to carry on, saying, "The war is far from over."